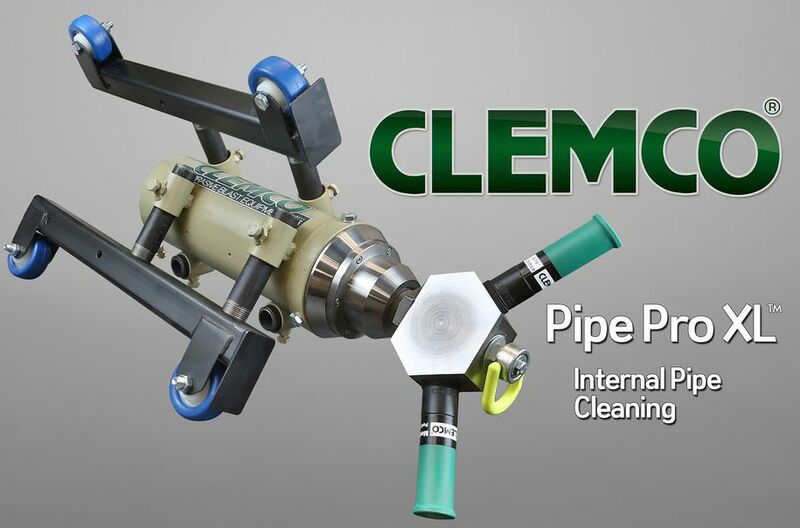 Clemco Hollo Blast and Hollo Blast Jr are an ideal choice for any application that involves blasting the interior of 3/4” – 12” ID pipe. 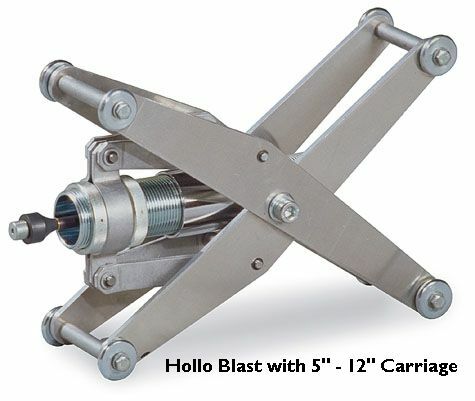 Hollo Blast tools pass incoming abrasive through a centralized nozzle, and then disperses the focused material outward 360° after contacting the angled deflection tip located at the end of the unit. This even distribution of abrasive allows for a repeatable degree of cleanliness and consistent blast profile within the blasted pipe. The lack of moving parts in this unit make it a user friendly and easily maintained alternative to air driven internal pipe tools. 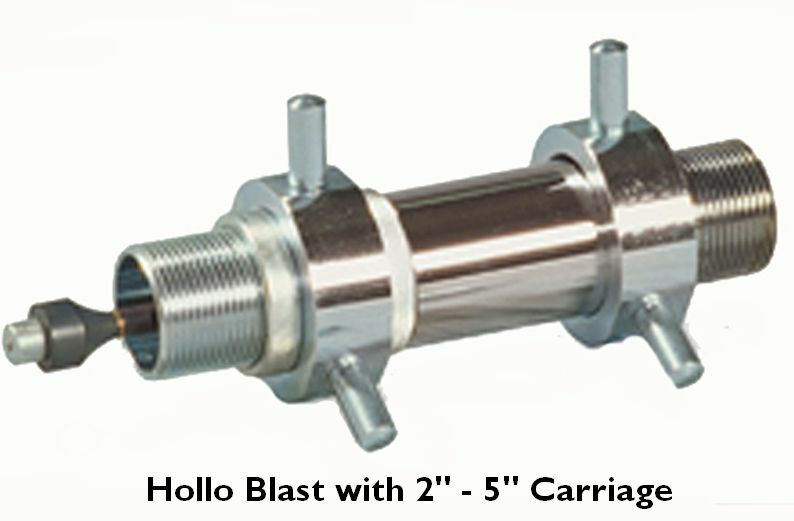 Hollo Blast Jr comes standard with a 9/32” tungsten carbide nozzle which consumes 80 cfm at 100 PSI while the standard Hollo Blast is available with a 1/2” or 5/8” nozzle which consume 200 cfm and 350 cfm respectively at 100 PSI. The Hollo Blast also features wear components cast in alloys with higher abrasion resistance – boron carbide and composite material (ROCTEC). When the need for high production cleaning of larger diameter pipe is involved, the Spin Blast tool offers unbeatable performance. The key to this tool’s performance is the rotating head outfitted with two standard blast nozzles. 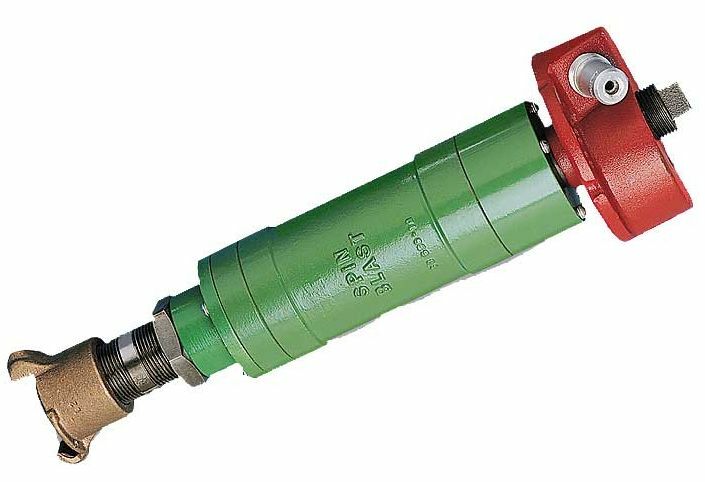 These nozzles drive the rotating head around propelling material outward 360° at speeds that are significantly quicker than deflection tip style devices. This increase in production allows for quicker cleaning rates and improved throughput. 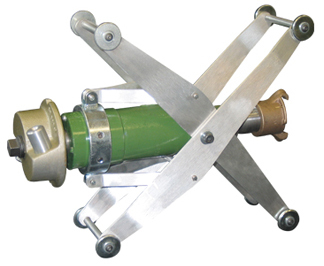 The standard Spin Blast model will blast 8” – 36” ID pipe utilizing one of two different carriage devices to keep the tool centered in the pipe. The large Spin Blast tool will blast 36” – 60” pipe utilizing long venture nozzles and a single carriage system. 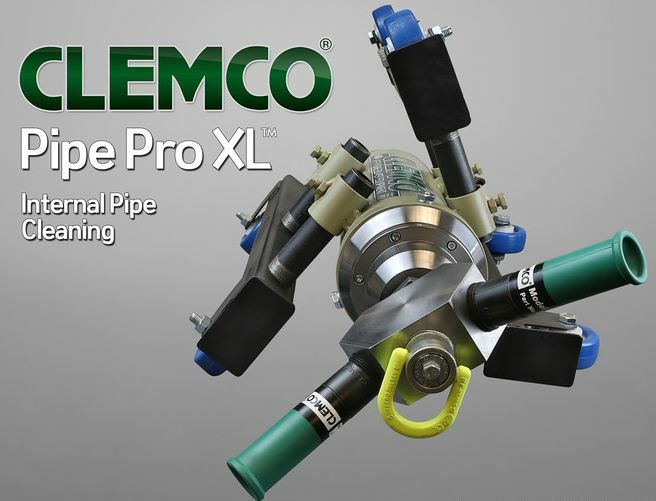 The Clemco Pipe Pro XL is an upgraded version of the standard Spin Blast tool. It features a variable speed air motor which drives the rotating head at whatever RPM the operator designates. This allows for precise control of the abrasive blast speed allowing you to achieve whatever the desired degree of cleanliness quickly and consistently. Upgraded urethane wheels assist with rolling the tool smoothly and with minimal effort. A variety of nozzle sizes are available to accommodate specific compressor sizes, abrasive types/size and pipe ID’s. Copyright © 2016 T-Tex Industries. All Right Reserved.